We have been recently receiving many suggestions about adding support for attachments, and we are proud to announce that this has been now implemented and released as an experimental feature for all Unlimited plan subscribers. If you are Unlimited plan subscriber, you can enable attachments on board "Settings" > "Card Template Editor" page. With task attachments you can store all relevant information together and easily share it with your team. 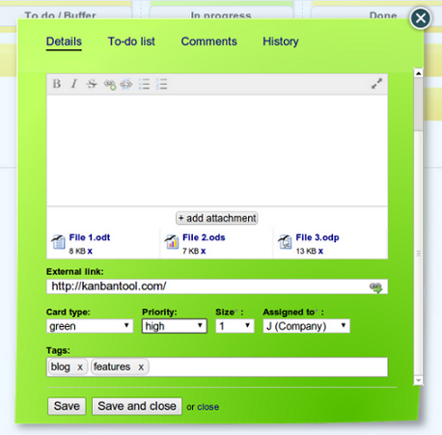 We have also made visual improvements to the task tags field. It's auto-completing and much easier to use now.